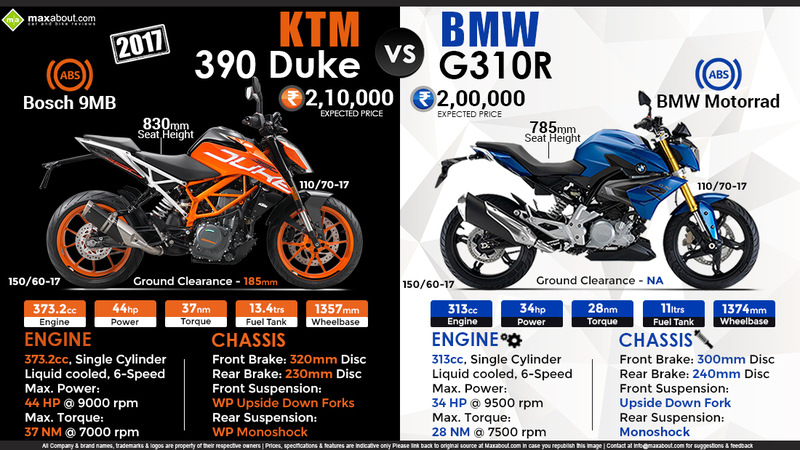 2017 KTM 390 Duke and BMW G310R are now the most awaited rival duo for Indian motorcycle industry. Both of them carry the naked street fighter looks and a reputable brand name attached to them. KTM 390 Duke uses a bigger 373.2 cc engine producing around 44 HP of peal power and weighs just 149 kg (dry weight) while the BMW G310R uses 313 cc engine producing 34 HP and weighs 158.5 kg (wet weight). Both of them are expected to launch next year as BMW was expected to launch the G310R by October, which unfortunately didn’t happen. The KTM 390 Duke now carries 830 mm of high seat height while the BMW G310R plays safe with 785 mm of accessible seat height. The tyre profile on both the bikes is same while different manufacturers will be supplying the same to both of them. Dual channel ABS is standard on both the bikes while KTM 390 Duke is expected to get a bigger price tag (INR 2.10 lakh) over the BMW G310R (INR 2 lakh). Click here to know more about KTM 390 Duke (2017).